Today has been a day for playing with new tools. 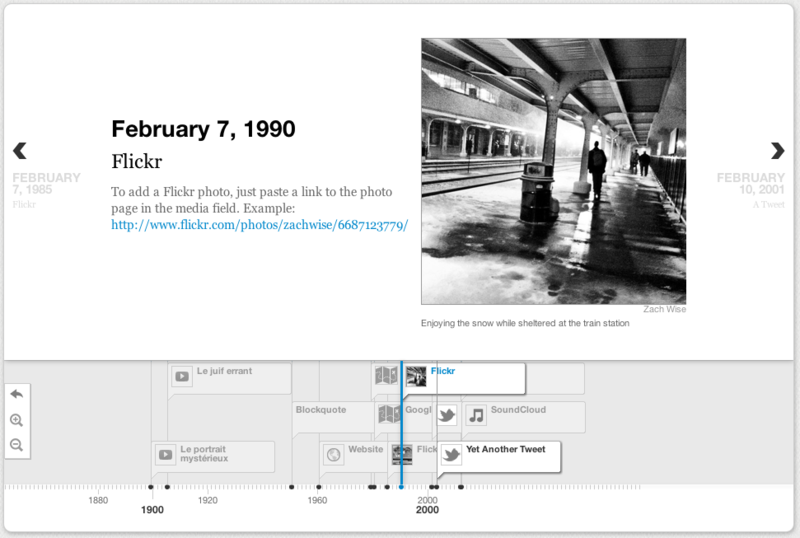 My favourite is Timeline, a curation tool that allows you to present a variety of different online media in an interactive timeline. It is very pretty, although it appears to involve a bit of fiddling with code to use – no “drag and drop” interface just yet. You can download and self-host all the files you need, so you have complete control. One of the main risks of using third party tools for any aspect of event amplification is that they can change, break or even disappear entirely without any notice. I spend a lot of time devising back up strategies for such tools, and considering the longer term preservation of materials created/collected within them. For this reason, tools that allow export of materials in a reusable format and self-hosted solutions are always preferable, although as I have reflected before there is still the issue of who should be maintaining event materials in the longer term and for how long. When you are amplifying an event you ideally want to pick tools that work for the broadest range of people so you don’t discriminate based on device or browser (unless they are running IE 6). Arguably, an event amplifier should test all of the tools they plan to use ahead of an event so they know where the support issues are likely to arise and where alternatives may be required for certain sections of the audience. However, this is not always practical for every event and every tool. A clear message about known issues – in this case, a problem with iPhone compatibility and an IE 8 bug – can help enormously. Pulling together materials from different sources has been one of the powerful uses of Storify, and Timeline offers a similar level of flexibility, with sources including Twitter, YouTube, Flickr, Vimeo and Google Maps. Whilst event amplification and transmedia approaches favour materials being spread out over different platforms and in different formats to encourage engagement in different contexts, there is still a need to make sense of these resources as part of an overarching narrative and to provide some kind of guided route through the materials to aid discovery. There will be times when a Storify commentary will suit the requirements of an event, and there will be times when a timeline will be the better way to contextualise the materials – particularly when an event is part of an ongoing series. The event that immediately springs to mind is IWMW, which has a history of over 15 years and a plethora of digital materials which could be woven around key external events to show how the event has evolved and responded to the needs of the target audience. One of my slight gripes with Storify is that it is designed for a single user/curator, rather than offering any group authoring options. Whilst a Timeline can be created by one user editing the JSON code, there is also an option to build a Timeline using a Google Doc spreadsheet. This means that one could choose to create collaboratively by sharing the spreadsheet, which could prove very useful indeed – particularly at large-scale events where there are multiple event amplifiers/journalists covering the proceedings. Thanks for a great post! I”m really looking forward to hearing how your test of Timeline went. Especially with multiple curators working on a single event.